Everybody knows that drinking water is good for your health. And as a rule of thumb, you are told to drink at least two litres of water a day. But staying hydrated can be difficult – and sometimes boring. After the first few glasses of water, you might begin to find the taste gets boring. And after you’ve put down two entire litres? You may never want to drink water again! This is why sometimes people get tired of plain water and look for something a bit more exciting, or perhaps a bit of variety. And sometimes they choose sparkling water. But you may also have read that carbonated water has a reputation for damaging teeth and harming oral health. The answer is, probably not. Let Mayfield Dental Care take you through the chemistry, studies, and truth about your teeth and carbonated water. A beverage’s pH is the most significant factor in its ability to erode teeth. Beverages with a pH below 4.5 or so can represent a threat to dental health. The lower the pH, the more acidic a drink is and the more damage it can do. Regular tap water normally has a pH of about 7, which is a nearly perfect partner for your mouth, which has a pH of about 7.4. Carbonating water lowers its pH to about 5 (sometimes lower). This is what many dentists consider a safe range – erosion becomes more likely at a pH below 4.5. But when flavours are added, particularly citric acid, trouble begins and the resulting lowered pH may start to erode calcium from the teeth. When you add carbonation to water its acidity can be increased. A 2007 study in the International Journal of Paediatric Dentistry determined that some flavoured sparkling waters have a pH as low as 2.7, far below the safe pH level and equivalent to the erosive power of orange juice and nearing that of sodas. But not all the news is bad! The first thing to know is that the acidity of sparkling water is substantially less than that of citrus juice or many sodas and sports drinks on the market. It’s just safer for teeth. Further, non-flavoured sparkling waters have no sugar, and everyone knows that sugar is a significant threat to teeth. So, how safe is sparkling water? Most dentists believe the risks are small. 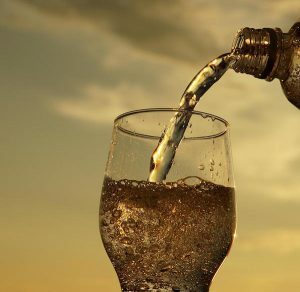 Of course, the best beverage to drink for your oral health is water that contains fluoride, but sparkling water seems to present minimal risk and a smaller risk than many other choices. If you follow this advice, practice good oral hygiene at home, and schedule regular dental check ups at Mayfield Dental Care, sparkling water can be a part of your healthy lifestyle! Call us we’ll take a look at your teeth. We’ll even check them for signs of erosion! Our guiding principles are innovation, culture and care. Our equipment is cutting-edge and our outlook is forward-looking to provide you with the best dental experience you have ever had.